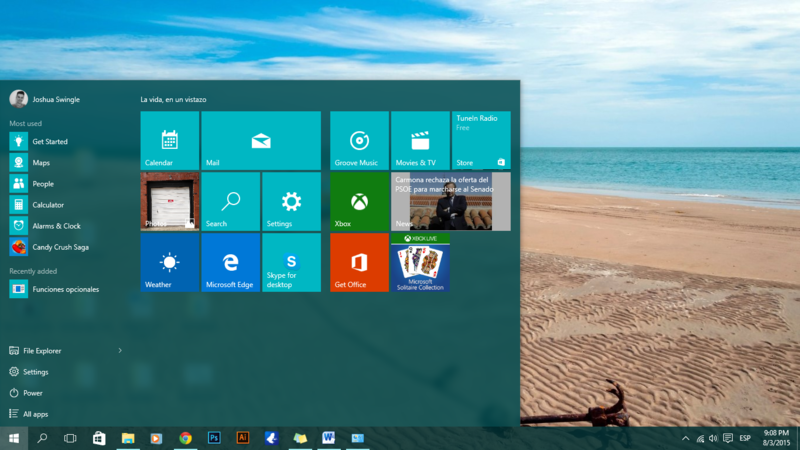 Windows 10 is Microsoft’s latest version of the Windows operating system, one that is make-or-break for the company. The company has to make up for the mistakes it made with Windows 8 back in 2012, an operating system that, even though improved the following year with Windows 8.1., was a completely drastic change coming from Windows 7, and something that most users didn’t like. Thankfully, Microsoft has realised its mistakes and woken up to the fact that people aren’t obligated to use Windows. 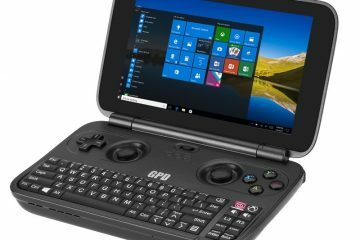 Now the company is treating Windows as a platform for all, not just an operating system for PC’s, but one that can run on the ARM platform for tablets and smartphones, and now universal apps will run not only on PC’s, but on phones and Xbox as well as IoT devices. If you are running Windows 7 or 8.1, you will be able to upgrade to Windows 10 completely for free up until 29 July 2016, one year after the initial launch. Once you’ve upgraded, you will be able to use the operating system for free forever. The operating system will be available in 190 territories and in 111 different languages. If you miss the one year deadline for the free upgrade, you will have to purchase an upgrade version, with Windows 10 Home costing $119 and the Pro version costing $199. The initial launch will be for laptops and PC’s, but eventually mobile devices and Microsoft’s own Xbox and HoloLens will receive the update. Currently the mobile update is expected to be released in November this year. It’s good news for those of you who skipped Windows 8 because of the drastic changes it brought. Windows 10 backtracks and is more like Windows 7 than 8. 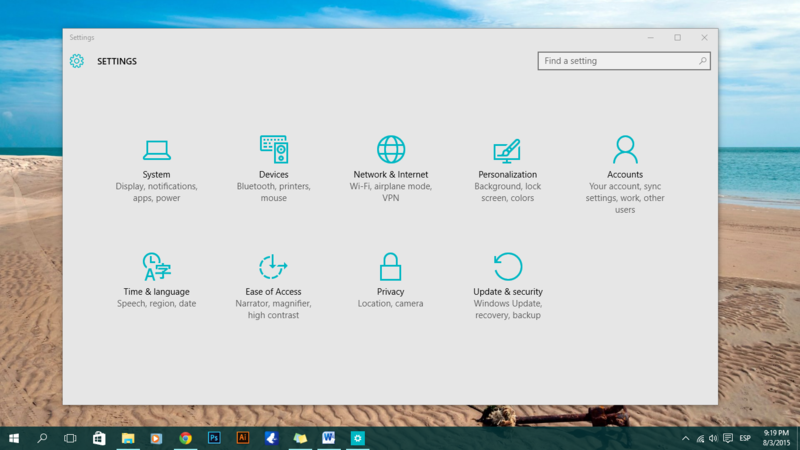 The Start menu is back, Key actions are now accessed from the Taskbar and the overall design is just more refined. If you are coming from Windows 8, like me, you may find yourself still moving the mouse over to the corner for the first few days, expecting the Charm bar to appear, but then realising that it’s no longer there. The Start menu is a basically a blend of Windows 7 and 8. 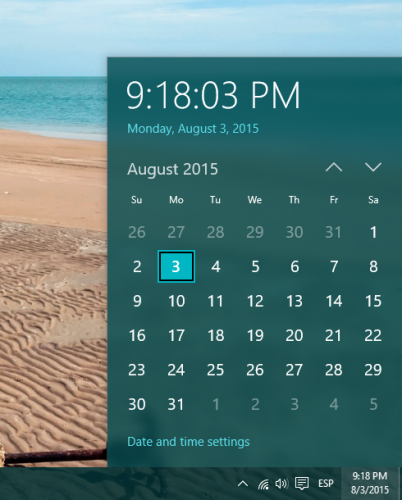 It features the Live-tiles that Microsoft emphasized in Windows 8, giving you small bits of information from the apps. You can scroll through the tiles and resize them, as well as group them and rename those groups, though the live tiles cannot be completely switched off. Another feature is the ability to resize the whole Start menu, by dragging the side or top of it. The rest of the start menu is similar to Windows 7, with controls for restarting and turning off your PC, as well Settings, File explorer and the ability to scroll through all apps alphabetically. There is also a list of recently opened apps and recently added apps. If you are one of those people that loved Windows 8 and its Start screen, don’t worry, it can be enabled in the settings, allowing you to replace the Start menu with the screen. The action centre is essentially the PC’s version of the notification panel that’s present on smartphones, Windows or not. The action centre is launched in the system tray by clicking on an icon that looks similar to a messaging logo. 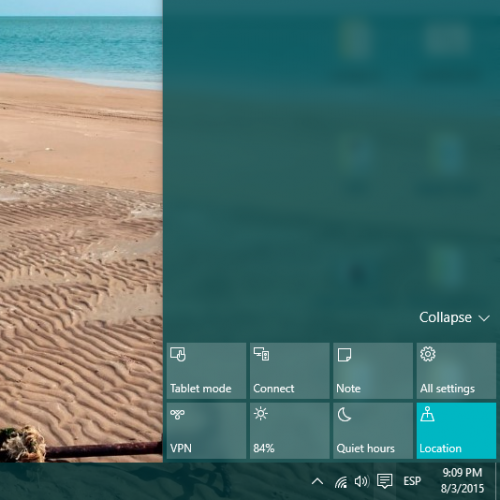 You will also notice that most charms from Windows 8 have been moved here as well as all notifications from apps. 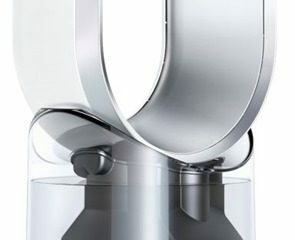 When you first open it, you will notice a group of individual settings at the bottom of the Centre, also known as Quick Actions, most of which are standard to most users with a smartphone, such as the ability to toggle Bluetooth, Wi-Fi or the Location On and off. Also present is the Note feature, which instantly launches the OneNote app, a settings button, the ability to switch into Tablet mode and the ability to connect to other devices such as speakers or printers. All of these Quick Actions can be modified in the Settings menu, allowing you to choose which ones appear in the Centre. When a new notification appears, a pop-up will appear in the bottom-right corner of the screen, instead of the top-right like in Windows 8. 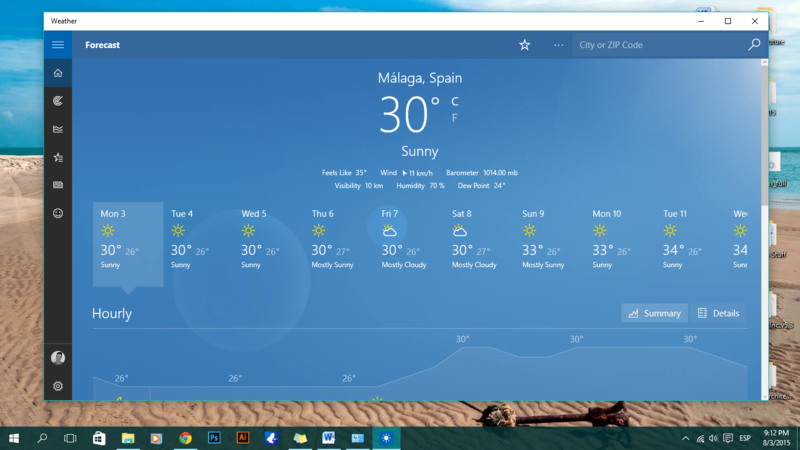 The taskbar is relatively unchanged; it now has a dark, flat design and apps that are open now appear with a subtle coloured line underneath their icons. 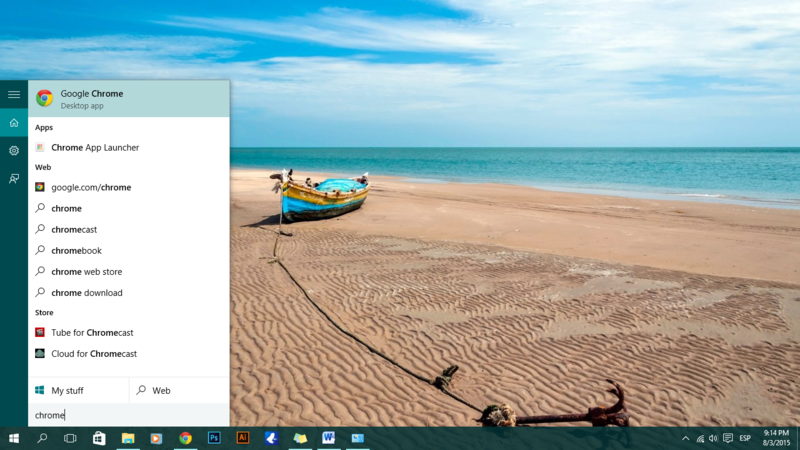 The newest additions to the taskbar are the new Search bar alongside the Task view icon. The search bar enables you to search for files and settings from your device as well as search the Internet. Also available is Cortana, but more on Search and Cortana later. The Task View icon is the other addition. By clicking the icon it gives you a preview of all currently running apps, a feature that has been available in previous version of Windows, but something that relatively few knew about, that being the reason for the addition of the button. The System tray, now known as the Notifications area, which is situated on the right side of the taskbar, has been made much simpler by the addition of the Action centre mentioned earlier. Microsoft has given the calendar an overhaul, now with a much simpler and intuitive design, and just like in previous versions of the OS, you can minimize everything by clicking in the far right-hand corner of the Taskbar. Search is another thing that’s different. It’s now contained within the taskbar, though you can still click the start menu and start typing to search something. The search bar allows you to search for files and settings in your device as well as search the Internet, such as google or the Microsoft Store. All of this is available alongside Microsoft’s virtual assistant Cortana. Now there’s a lot more you can do, because all the features from Windows Phone are now in Windows 10. You can type or ask, “What’s the weather going to be like this weekend?” and Cortana will display a forecast in the search menu. You can also say “Remind me to go to the supermarket on Friday” and Cortana will set up a reminder for the correct time. But there’s more to Reminders, as Cortana can link them to people and places. So you can say “Remind me to ask Josh about the concert tickets” and Cortana will ask whether you want to be reminded at a specific time or place. Regarding places, you can say “Remind me to get water and bread when I go to the supermarket” or “Remind me to water the plants when I get home”, and Cortana will set a reminder for when you are next at those places. Cortana will show you top news stories, identify the music you’re playing and shows you a ‘Daily Glance’ which displays a summary of the day’s meetings, weather and information about your daily commute. Also, if you give permission, Cortana will access information from your emails, such as your flight number, and warn you if there’s a delay or if there’s heavy traffic on the way to the airport, which may prompt a suggestion to leave earlier if it’s necessary. Finally, Cortana can set alarms for you, record notes, play specific music, launch apps and give you directions. 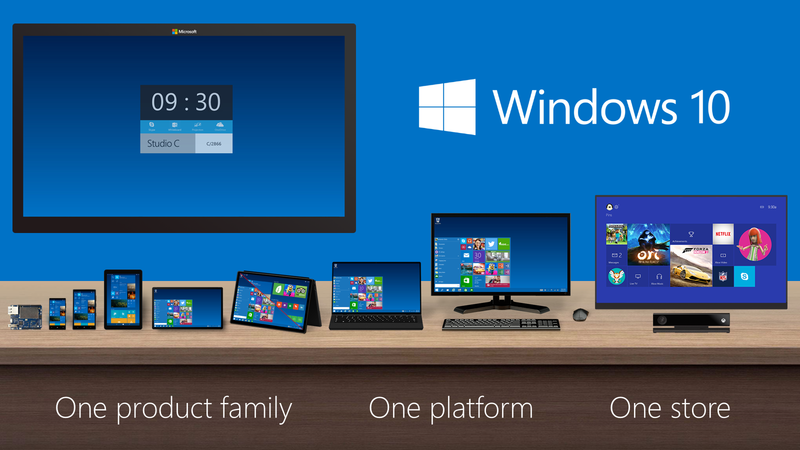 Microsoft is making a big push in terms of apps for Windows 10, built-in or not, the so called Universal Apps. 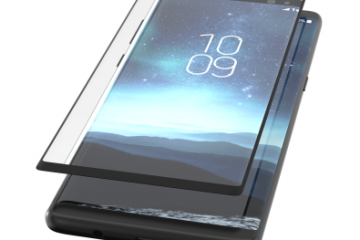 The idea is that developers will be able to create an app that can not only run on PC’s but also on smartphones and Xbox. These are the replacement for what were know as Modern UI apps in Windows 8 and 8.1. Also, Microsoft is making it easy for developers to port existing Android apps to Windows and its Visual Studio 2015 now supports Objective C, which is used to create iOS apps. All of this is Microsoft’s effort to avoid the mistake it made with Windows 8 – It assumed that developers would rush to create apps for the OS. There’s also a new Windows Store, which will house Universal apps as well as desktop ones. Microsoft has significantly improved the design and overall quality of the built-in apps. The new photos app now provides you with editing and filter capabilities as well as a complete back catalogue. It also has a pretty decent viewing experience and pulls photos from OneDrive. The old Windows Photo Viewer is still there if you prefer. The Movies & TV app now allows you to buy or rent films or TV shows from the new Microsoft Store. The app is split into three sections: Movies, TV and Videos. Mail has a new clean-looking design, while now having the ability to manage multiple emails accounts including Outlook, Google, iCloud and Exchange. Another app that has been improved is the weather app, now featuring a much simpler design, a 10-day forecast, historical weather for your location and weather related news. The Music app combines the music that’s stored on your device with any music stored online in your OneDrive Music folder. Plus, it also integrates Microsoft’s newly renamed music streaming service Groove. Microsoft’s new browser, Microsoft Edge, is actually pretty good and quick, it still has its flaws, but it’s a significant improvement over Internet Explorer. Still to come is support for extensions, which developers can easily port from Chrome. Favourites can be easily moved from another browser, as can bookmarks. The most impressing feature in Edge is the extremely quick page rendering. There’s also a new Dark theme to go alongside the standard Light theme. 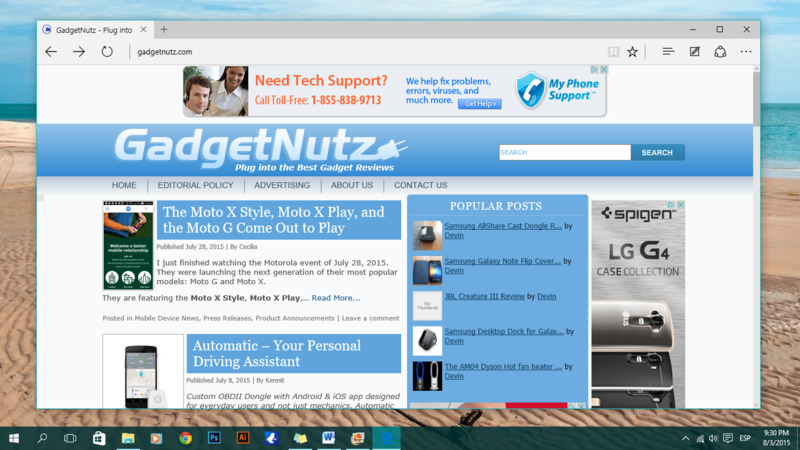 Cortana is also incorporated into Microsoft Edge. The settings app has also been improved greatly. In Windows 8, you would open the app, realize you couldn’t do what you wanted and would find yourself going back to the Control Panel. Now, the app has many more uses and is a lot simpler and cleaner. Everything is divided into different categories making everything easier to find. Windows 10 is basically finished now. It seems that Microsoft has managed to create a Windows that will be welcome with open arms, both by developers and consumers, especially considering the fact that it’s available completely for free to the latter. 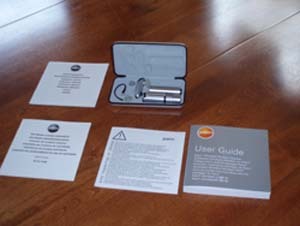 But above all, the system is simple to use, has a nice design, and is pretty quick. There are still some things that need work, mainly the Edge browser, but that’s nothing major and definitely not a reason to not upgrade. All in all, if you liked Windows 7, or even 8, then I’m sure you’ll love this upgrade. 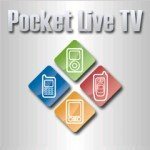 I Want My 8525 Pocket Live TV!